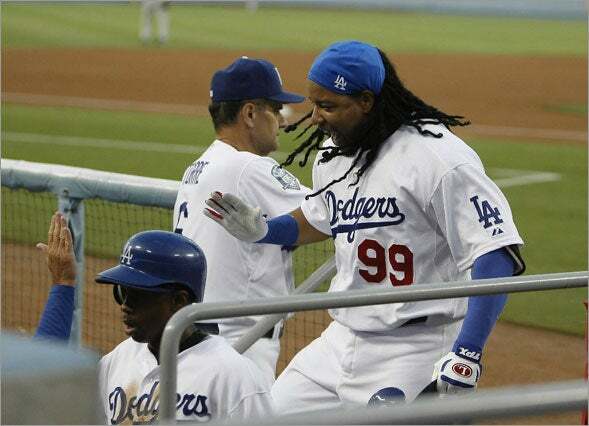 Old friend Manny Ramirez is looking right at home in Los Angeles after just two games with the Dodgers and it sounds like he’s already ready to finish his career in LA. We’ve got a full media roundup of Manny’s comments this weekend on finding peace in LA, his difficulties playing in Boston, the Hall of Fame cap question, Dodger fans, and more along with Manny’s agent Scott Boras refuting a Globe report that Ramirez lobbied to remain in Boston after learning he had been traded to the Dodgers. “I like this city, the environment, the energy in the fans. I think that I’ll play here for the remainder of my career,” Ramirez said in an exclusive interview with ESPNdeportes.com. “The Dodgers brought me here to end my career in this city — at least that’s what I’m thinking. However, we haven’t even discussed the future. I’m simply starting to know this team,” Ramirez said. As for his first game with the Dodgers, Ramirez disagreed that he didn’t hustle on a ball to the left-center gap by Chris Burke that went for a triple. How bad was the relationship between the Boston Red Sox and Manny Ramirez? Bad enough that the dreadlock-sporting outfielder isn’t sure if he wants to be inducted into Cooperstown wearing a Red Sox cap. There was also a reporter from a Spanish-language station who wanted to know if Ramirez would be interested in doing telenovelas, which are Spanish soap operas. “Whatever happened in Boston is in the past — I’m thinking blue now,” said Ramirez, who was unable to finish his statement with a straight face (“Think Blue” is the name of a marketing campaign the Dodgers use to sell tickets). Ramirez, much like McGwire back when he was in front of Congress, used the word “past” frequently. Former Red Sox teammate Nomar Garciaparra, who’s now with the Dodgers, said the Red Sox seems to have a modus operandi of letting players go before they want to leave — Wade Boggs, Roger Clemens, Johnny Damon, Garciaparra and Ramirez to name a few. As for his new number, 99, he explained that it simply was the number he was issued. There seemed to be some discrepancy about that, though. His former number, 24, is unavailable because the Dodgers retired it in honor of legendary manager Walter Alston. Ramirez’s second choice was No. 34 but, well, that was Fernando Valenzuela’s number. “It’s not retired, but it’s retired in our hearts,” said Mitch Poole, Dodgers’ clubhouse manager. A series of text messages between the Dodgers and Ramirez’s representatives finally produced 99. “The Dodgers said that’s fine if that’s what you want to wear,” Poole said. Beimel, by the way, wears No. 97. Maybe the Dodgers simply issue numbers in the 90s to their long-haired dudes. A guy from the Jimmy Kimmel show — hey, this is Hollywood, baby — asked whether Ramirez needed someone to show him around Los Angeles. In Spanish, Manny explained he’s got one of those navigation systems. After rounding the bases to raucous applause and being greeted by Juan Pierre with a hearty slap on the helmet at home plate, Ramirez was serenaded by chants of “Man-ny! Man-ny!” as he returned to the dugout after his first-inning home run. Ramirez’s teammates nudged him to the front of the dugout for a curtain call in which he raised his cap to acknowledge the fans. Ramirez seemed irked when asked about the report before the Dodgers played Arizona at Dodger Stadium. [Curt] Schilling, appearing Thursday on Boston radio station WEEI, said he suspected Boras played a role in trying to force the Red Sox to trade the 36-year-old Ramirez. Boras said Ramirez did not hire him to figure out how to become a free agent this year, let alone to devise a scheme to get the outfielder out of Boston before then. “I never contacted the Red Sox after the deal was made,” Boras said. “Theo [Epstein] and I had many discussions,” Boras said. “Both parties agreed that it was in the best interest of everyone involved for Manny to move forward.” Boras did not address whether the dropping of the options was discussed in his earlier conversations with Epstein. The Red Sox did not respond to messages seeking comment on the story or Boras’s denial. Manny loves you sooo much, he never wants to leave you. Wants to spend the rest of his career in Dodger Blue. And you already love him. Buy tickets to see him. Chant his name. Rise to the edge of your seats when he bats. Lose your collective breath when he absolutely rockets a pitch out of the ballpark. Now you know how these instant love affairs normally end up. All heat and passion in the moment. All “What was I thinking?” the next. Absolute wild guess, but I’m thinking Boras believes he can garner more than $20 million per, or there’s no movement to drop the options. Kinda hard to see our resident super agent sitting down with general manager Ned Colletti and saying: Hey, he just wants peace! He’s more than willing to take a new-home discount. Cue Barry White: Can’t get enough of your love, baby. So much mush, it almost makes you want to turn away in embarrassment. Manny said he went out to dinner Friday with some of his teammates and there was no mob scene. No disruptive combustion. No frantic paparazzi. “Nobody bothers you,” he said. “In Boston, it was like from the stadium to home. That certainly makes him the Parking Lot Attendant’s favorite kind of player, I say, Frank McCourt probably more than happy to give him peace, so long as he doesn’t have to pay him. Ramirez loves it. “Come here and sit on my lap,” he says, and I wonder what the newspapers’ expense account policy is for tipping baseball players for lap dances. My buddy wants to move on, but there’s one more question about Schilling’s criticism of him. Sitting on splintered seats, Ruiz and his fellow Dodgers loyalist Renato Casas told me Saturday night they feel like they’ve died and gone to heaven. As Manny explained afterward, he’s still a little nervous in his new surroundings. That may be the case, but Ramirez still managed to carry himself like a rock star, a presence lost neither on his teammates nor his manager. “It’s had a great effect on the ball club,” smiled Joe Torre. “The players, they get excited. Manny’s got that kind of personality and that kind of ability. Hopefully, we can build on it.” If nothing, else, I would plan on seeing Dodger fans trip over themselves in an effort to see Manny help shape a box score. It was his second day at the Ravine and flashbulbs were still popping like champagne corks on New Year’s Eve every time he stood at the plate. I think it’ll be a while before that reaction dies down, if it even does at all. …it’s immediately striking to enter the room and hear Latin music- featuring a jumpy beat and funky horns- blaring from an iPod deck. It also becomes immediately apparent that a clubhouse with a locker owned by Manny Ramirez is very different than the one I’ve become used to covering the Blue for three seasons. Blue Notes also has audio links to Manny’s pregame interview last night, complete with all the chuckles from the LA media and Manny’s music blaring in the background: Part 1, Part 2.